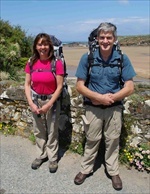 There was a good turn out for this entertaining and informative talk on the Cornwall Coast Path by Rob & Denise. 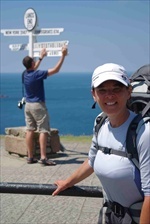 The whole path is over 600 miles, Rob & Denise did the 203 miles from Bude to Falmouth. 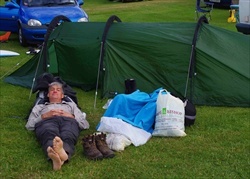 They spent 17 nights under canvas and 7 nights in B&B. The start at Bude, 203 miles to go! 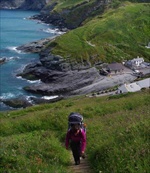 Below you can see one of the many steep climbs on the walk - this one from Crackington Haven, on the way to Boscastle - 18 miles this leg. 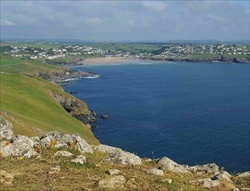 The next day was also a long one - via Tintagel to Polzeath, 19 miles. A welcome rest after quite a tiring day. 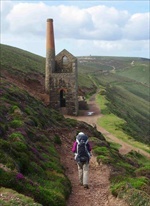 Below is Wheal Coates, one of the many disused Mine buildings. 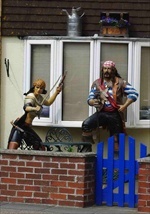 Some of the inhabitants of Portcothan were in fine form! Afternoon teas became a regular activity, a welcome sit down in a comfy chair. 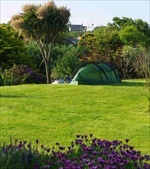 Best Camp site - at Gwithian Above is Porthminster beach, next to St Ives. 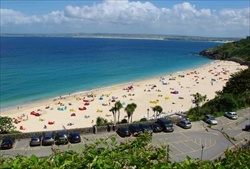 Gwithian camp site is across the bay! 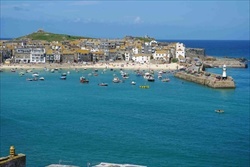 St Ives harbour in bright sunshine, another nice day. Many flowers were out - late June. 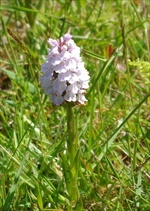 This is ( I think) a heath spotted orchid. 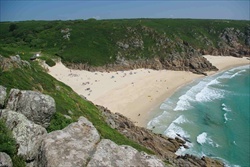 So to Porthcurno, The white hut is where undersea cables were terminated. The Cable and Wireless museum is here, where the history of cable technology can be seen. Also here is the Minak theatre - we saw a production of Zorba the Greek . 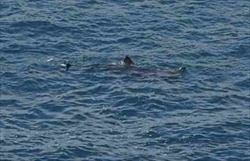 Along the coast at Lamorna cove we saw a basking shark. Also we spotted a pair of choughs - like crows but with red feet and red beaks. St Michael's mount in bright sunshine. In the distance can be seen Moushole, Newlyn and Penzance - the previous day's walk, when the sea mist descended. 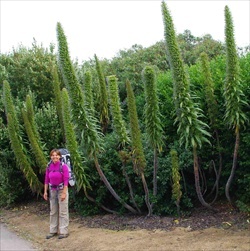 Whatever these are, they are too big for my garden! 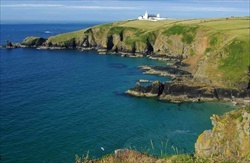 Plants at Praa Sands. 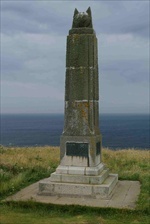 The next technology marker was the memorial to Marconi's first wireless call to America. Wireless superseded the cable in the 1930's. 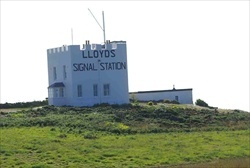 Lizard Point - the most southerly place in Britain This signal station was used to get messages from ships to Admiralty in London as quickly as possible until the introduction of the cable at Porthcurno in the mid 1800s. This was essential to manage the British Empire. 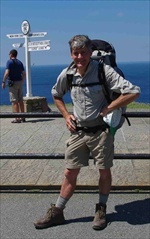 Helford Passage - the ferry is contracted to provide passage for Coast Path walkers. We made it! 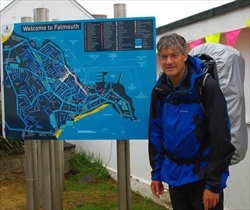 The end of our walk at Falmouth.